So in today’s post i decided to focus on the WWII Women’s Army Corps of the US and some interesting regulations they had to follow. The first rule we will be discussing today, is the hair do’s and don’ts! It will also be very helpful for all the ladies who plan on starting re-enacting a WAC. 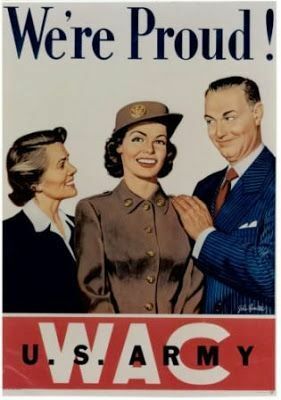 To begin with, the original announcement about the WACs regulations from the US army was focusing on a lot of things we will be discussing on other posts. However, the hair section says ‘Tresses must never touch your collar. Easiest solution: cut them off. If you have to have them, roll them up and tuck out of sight. Never use them for a backdrop’. I think this helps you understand why many WACs had short hair (and also women from ANC, WAVES, WASP etc. since the regulations were the same for everyone). But during that time, many women had short hair anyways so it definitely wasn’t something new. Air WAC, Dora Feinbloom. Gift of Arlene Hanauer, The National WWII Museum, 2011.514. The hair had to be above the collar so it wouldn’t hide the insignia. Thus, women had to pin their hair up or curl it. If you have long hair and are a re-enactor you probably know the struggle of pinning your hair up the correct way. It was very tough for me at the beginning and i still find it hard at times (when my hair doesn’t cooperate…) But everyone finds their own ways of making their hair stay. The number one tip is to always have your hair in curls before attempting to pin it up. It is way more convenient than having straight hair! Also, some hair tools like a vintage roll is very useful for long hair (and shorter as well). You can watch a very helpful tutorial here to guide you the right way. They are plenty of tutorials online but this one is one of my favorite. 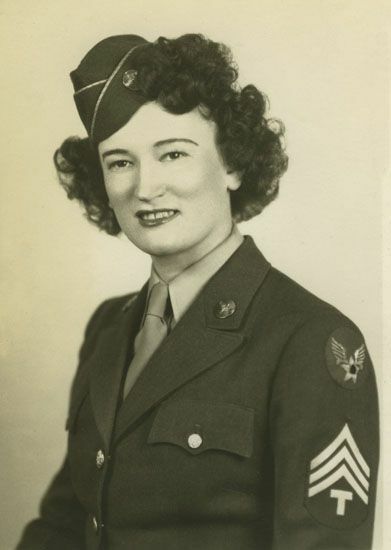 WAC Helen M. Latt (Alabama) (right). Last but not least, something you should not forget is that you will be either wearing a Hobby Hat (right picture), a garrison cap (left picture), a jeep cap, a helmet and so on. So, be careful with the upper part of your hair and do not overdo it with the victory rolls! So that was it for today’s post! I hope it was helpful for both re-enactors and not. If you have any questions or want to add something, leave your comments! Thank you so much for reading. I will see you on my next post!